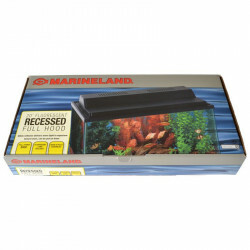 Marineland's Fluorescent Strip Light is a universal fit to fulfill your fresh or saltwater aquarium's lighting needs. The durable, injection-molded fixture features interior reflectors for maximum light output. Instant-start feature allows the use of timers as needed. Top vents provide heat dissipation, water-resistant rubber boots protect switches from corrosion. Can also be used for terrariums. Note: Must be used with a glass or acrylic top. Bought this to replace a reptisun hood. LOVE it! The vents on top of the hood make it so that the hood doesn't get overheated like the issue I have had with other hoods for my terrariums. I have bought 3 of these and all from PetMountain. Amazing prices and great product. This hood works great with my reptisun 10.0 24" fluorescent bulbs. It fits perfect on both my 30 gallon and 40 gallon tanks. Fixture was better than my old one by far. 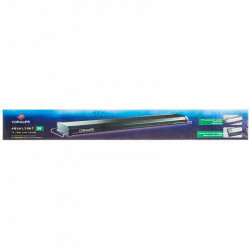 The new ones do not have magnetic ballasts in them and use less electricity. 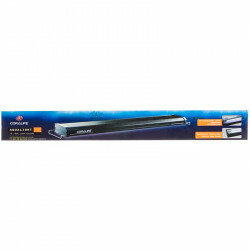 The metal reflector makes it safer and provides more light where it is needed. The bulb came broken and was an off the wall size made in China. After making some calls to the manufacturer to find out what sizes worked in the fixture I called PetMountain, explained about the bulb coming broken and that the size was odd. They made the bad bulb good with even a better bulb than the one that originally came with the fixture. They shipped it right away and I recommend PetMountain to anyone and everyone. Generally a good product. It works, reliable, and conservative style. The only thing is that the fixture is not a Electrical ballast. It uses the "Starter bulb" to ignite the light. 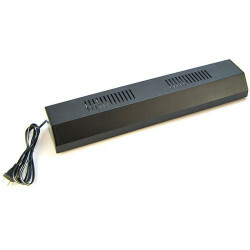 Electrical ballast do not need igniting fixture. Perfecto needs to upgrade its Fluorescent strip light. excellent...except, starter ($0.99) was defective. have spares, so no big deal. Would buy again. These work as well as needed. Turn on and off with timer. Basic and good.